One of the two YC-14 prototypes conducting flight testing. The Boeing YC-14 was a twin-engine short take-off and landing (STOL) tactical military transport aircraft. It was Boeing's entrant into the United States Air Force's Advanced Medium STOL Transport (AMST) competition, which aimed to replace the Lockheed C-130 Hercules as the USAF's standard STOL tactical transport. Although both the YC-14 and the competing McDonnell Douglas YC-15 were successful, neither aircraft entered production. The AMST project was ended in 1979 and replaced by the C-X program. In mid-1970, the USAF began a paper study, the Tactical Aircraft Investigation (TAI), with Boeing, McDonnell Douglas, and other companies to look at possible tactical transport aircraft designs. This study was a precursor to what became the Advanced Medium STOL Transport program. As a part of this program, Boeing began to look at various high-lift aircraft configurations. Boeing had earlier proposed an underwing externally blown flap solution for their competitor for the Lockheed C-5 Galaxy, and had put this to good use when they modified their losing entry into the Boeing 747. They had also done studies with the original Boeing 707 prototype, the Boeing 367-80, adding extensive leading and trailing edge devices using blown flaps. For the TAI studies, Boeing again looked at those mechanisms, as well as new mechanisms like boundary layer control. However, none of these studied designs were particularly appealing to Boeing. The Boeing engineers were aware that NASA had carried out a series of "powered lift" studies some time earlier, including both externally blown flaps, as well an upper-surface blowing (USB), an unusual variation. In the USB system, the engine is arranged over the top surface of the wing, blowing over the flaps. When the flaps are lowered, the Coandă effect makes the jet exhaust "stick" to the flaps and bend down toward the ground. They searched for additional research on the concept, and found that half-span upper-surface blowing research had been conducted in the NASA Langley 12-foot (3.7 m) tunnel. An examination of the preliminary results suggested that the system was as effective as any of the other concepts previously studied. Boeing immediately started to build wind-tunnel models to verify the NASA data with layouts more closely matching their own designs. By the end of 1971, several models were being actively studied. Another NASA project the engineers were interested in was the supercritical airfoil, designed by Richard Whitcomb. The supercritical design promised to greatly lower transonic drag, as much as a swept wing in some situations. This allowed an aircraft with such a wing to have low drag in cruise while also having a wing planform more suitable to lower-speed flight—swept wings have several undesirable characteristics at low speed. Additionally, the design has a larger leading edge radius that makes it particularly suitable for low-speed high-lift applications like a transport. Boeing incorporated the concept into their design, the first non-experimental aircraft to do so. The request for proposal (RFP) was issued in January 1972, asking for operations into a 2,000-foot (610 m) semi-prepared field at 500 nautical miles (930 km) with a 27,000 lb (12,000 kg) payload in both directions with no refueling. For comparison, the C-130 of that era required about 4,000 ft (1,200 m) for this load. Five companies submitted designs at this stage of the competition, Boeing with their Model 953 in March 1972. On 10 November 1972 the downselect was carried out, and Boeing and McDonnell Douglas won development contracts for two prototypes each. Wind tunnel tests continued through this period. In November, John K. Wimpress again visited Langley looking for an update on NASA's own USB program. Joe Johnson and Dudley Hammond both reported on testing and showed Wimpress data that verified the high-lift performance that Boeing had quoted in its proposal. By December 1975, Boeing and NASA Langley had arranged a contract for a full-scale USB testbed, which Boeing built at their Tulalip test facility consisting of a 1/4-scale wing with one JT-15D engine and a partial fuselage. Langley was particularly interested in the effectiveness of the D-shaped nozzle that directed the jet flow over the upper surface of the wing, as well as the resulting sound levels, at that time a major focus of NASA's civilian aerodynamics research. Two major problems were found and corrected during testing. The first was a problem with air circulating around the wing when operating at low speeds close to the ground, which had a serious effect on the spreading of the jet flow through the nozzle. This led to flow separation near the flap, and a decrease in effectiveness of the USB system. In response, Boeing added a series of vortex generators on the upper surface of the wing, which retracted when the flap was raised above 30°. Additionally, the tail surfaces were initially placed well aft in order to maximize control effectiveness. This positioning turned out to interfere with the airflow over the wings during USB operations, and a new tail with a more vertical profile was introduced to move the elevator forward. The first Boeing YC-14 (serial number 72-1873) flew on 9 August 1976. Two aircraft were built, the second being s/n 72-1874. The competing YC-15 had started flights almost a year earlier. Head-to-head flight testing at Edwards Air Force Base started in early November 1976. During flight testing, the YC-14 was flown at speeds as low as 59 kn (68 mph; 109 km/h) and as high as Mach .78 at 38,000 feet (11,600 m). However, it was found that the YC-14's drag was 11% higher than originally predicted. Modifications developed in wind tunnel testing, comprising the addition of vortex generators to the upper aft portion of the nacelles, deletion of the nozzle door actuator fairing, alterations to the aft end of the landing gear pods and the addition of aft fuselage strakes, reduced this drag decrement to 7%. The YC-14 also demonstrated the capability to carry the 109,200-pound (49,500 kg) M60 Patton main battle tank, something that was not demonstrated with the YC-15. At the completion of testing in the late summer of 1977, the YC-14 prototypes were returned to Boeing. The prototypes were not scrapped; one is stored at AMARC, located at Davis-Monthan Air Force Base and the other is on display at the nearby Pima Air & Space Museum. By this point, the seeds of the AMST program's demise had already been sown. In March 1976, the Air Force Chief of Staff, Gen. David C. Jones, asked the Air Force Systems Command to see if it would be possible to use a single model of the AMST for both strategic and tactical airlift roles, or alternatively, if it would be possible to develop conventional derivatives of the AMST for the strategic airlift role. This led to a series of studies that basically stated that such a modification was not easy, and would require major changes to either design to produce a much larger aircraft. Both the YC-14 and YC-15 met or exceeded the AMST specifications under most conditions. However, the increasing importance of the strategic vs. tactical mission eventually led to the end of the AMST program in December 1979. Then, in November 1979, the C-X Task Force formed to develop the required strategic aircraft with tactical capability. 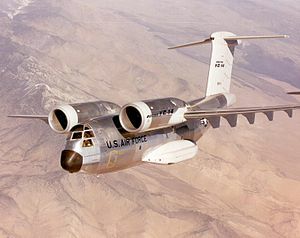 The C-X program selected a proposal for an enlarged and upgraded YC-15 that was later developed into C-17 Globemaster III. Upper surface blowing remains a fairly rare concept in use, and has been seen only on a few other aircraft, such as the Antonov An-72. Aircraft serial number 72-1873 is on display at the Pima Air & Space Museum in Tucson, Arizona. The other is in storage at the 309th AMARG boneyard at Davis Monthan Air Force Base (32°10′19″N 110°50′51″W﻿ / ﻿32.17184°N 110.84743°W﻿ / 32.17184; -110.84743﻿ (Boeing YC-14 at Davis Monthan Air Force Base)). ^ a b "Boeing YC-14 Military Transport". Boeing. Archived from the original on 29 June 2011. Retrieved 25 July 2011. ^ a b Norton, 2002, p.151. ^ Kennedy 2004, pp. 12-19. ^ Kennedy 2004, pp. 19-24. ^ Norton 2001, pp. 12-13. ^ Boeing YC-14. Pima Air Museum. Retrieved May 20, 2010. ^ Bowers 1989, pp. 554–555. Bowers, Peter M. Boeing Aircraft since 1916, third edition. London: Putnam 1989. ISBN 0-85177-804-6. Kennedy, Betty R. Globemaster III: Acquiring the C-17, Air Mobility Command Office of History, 2004. Norton, Bill. Boeing C-17 Globemaster III, North Branch, Minnesota: Specialty Press, 2001. ISBN 1-58007-061-2. Norton, Bill. STOL progenitors: the technology path to a large STOL transport and the C-17A, American Institute of Aeronautics and Astronautics, 2002. ISBN 978-1-56347-576-4. Wimpress, John K. and Conrad F. Newberry (1998). The YC-14 STOL Prototype: Its Design, Development, and Flight Test. Reston, VA: American Institute of Aeronautics and Astronautics, 1998. ISBN 978-1-56347-253-4. Wikimedia Commons has media related to Boeing YC-14. This page was last edited on 18 March 2019, at 00:14 (UTC).